Missouri Lieutenant Governor Mike Parson (R) outlined his business agenda Tuesday in Jefferson City, before the Missouri Economic Development Council winter conference. 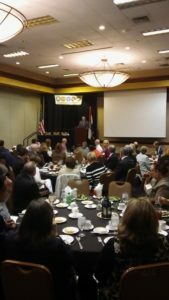 The Bolivar Republican spoke to about 150 business leaders, business owners and economic development professionals at the Council’s luncheon, which took place at the Capitol Plaza Hotel. Parson wants to see more retirees move to the Show-Me State. He says about 10,000 Americans retire daily. He asked the crowd to imagine if just one percent of them moved to Missouri. Parson also wants to roll back what he describes as “frivolous regulations”, saying that Missouri’s regulatory environment “has gotten out of hand”. He tells the audience that the biggest thing he heard from Missourians during the campaign involved government overregulation. “I think everybody is concerned about government getting too far into their personal lives through the regulatory environment, and frankly, you know, to a certain point, it makes people in business decide hey, do we expand, do we not expand, what is this regulatory environment going to be,” Parson says. Parson was elected as Missouri’s 47th Lieutenant Governor in November, beating former Congressman and former State Rep. Russ Carnahan (D-St. Louis). Parson says he wants to ensure that Missouri is a competitive place to start a business and keep current businesses thriving. He also emphasizes Missouri-made products and jobs, saying that 80 percent of new jobs in Missouri come from existing businesses. Parson also spoke to Missourinet after his presentation, discussing his address as well as right-to-work and the tight state budget. Lieutenant Governor Parson confirms he’ll have a “conversation” with Governor Eric Greitens (R) about the Governor’s proposal to reduce the Missouri Department of Agriculture’s budget from $53 million to about $40.4 million. Parson tells Missourinet it’s still early in the budget process. Parson says Greitens, a fellow Republican, has been “very open” to any conversation they’ve had. Parson, a third-generation farmer, has a cow and calf operation near Bolivar. The state Constitution requires the Missouri Legislature to approve a balanced budget by early May. Parson also says right-to-work will be “huge” for Missouri. Parson says right-to-work will help businesses statewide. The law is scheduled to take effect on August 28. Senate Minority Leader Gina Walsh (D-Bellefontaine Neighbors) says it will hurt middle-class families that drive the economy. Parson served six years in the Missouri Senate, being before elected Lieutenant Governor in November. He served three terms in the Missouri House before that, from 2005-2010.